Working in the construction industry typically requires the use of specialized equipment to carry out jobsite activities. However, doing any kind of construction in arctic conditions presents an even more unique set of challenges to crew members participating in a project. At Precision Equipment, we offer construction heaters that provide solutions to this problem. Our machines use a unique process to create and distribute clean magnetic heat to make even the coldest construction work environment more productive and efficient. In the search for a quality construction heater, there are several factors that should always be taken into consideration. Size - Always consider the size of the construction site to determine how much heater you need to meet your heating requirements. The general rule of thumb is that the larger the space, the more powerful a heater you need. At Precision Equipment, our heaters are built heavy duty and rugged with a wide range of output levels suitable for use in any industrial, commercial or construction setting. Power – Combating cold weather conditions requires a powerful heating system that works effectively in the harshest conditions. Our portable construction heaters put out up to 1,400,000 BTU making them powerful enough to tackle any construction heating application you can put it through. Our heaters and heavy duty heat exchangers are guaranteed up to 3000 hours and will deliver reliable performance while providing the essential level of heat you need during any winter construction project. Control – We design our job site heaters to give its operator control of the heating process to precise temperature levels. The built-in digital control and display panel make it easy to monitor and operate the heating system. LED lights positioned prominently on the roof of the machine make knowing the current operating status of the heater a simple process. All our heaters operate based on an industry standard SAE J1939 Engine CAN Buss Communications system. Type – At Precision Equipment, we have revolutionized indirect fired construction heaters by designing flameless heaters that provide benefits exclusive to our manufacturing process. The result is a heater that is low cost, easy to operate and that gives off a clean and efficient heat source. Convenience – Moving from construction site to construction site requires a simple and convenient heating system that is easy to transport and set up. 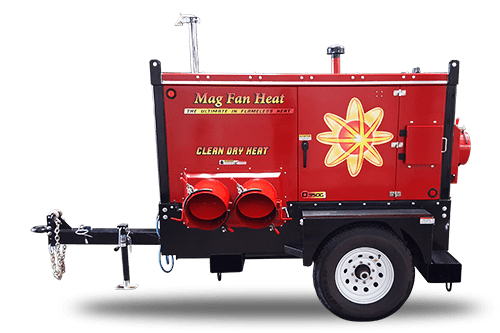 Our portable construction heaters come self-contained and hook up to a truck or construction trailer quickly and easily. The indirect construction heaters also feature large service access doors that make getting to the mechanical and electrical components of the heater fast and efficient during planned and emergency maintenance checks. Cost – Along with being cost-effective to purchase, Precision Equipment offers temporary construction heaters that are low-cost to operate. Safety and control features that help to prolong the life of the equipment along with operational efficiency levels exceeding 90 percent mean the long-term cost of owning and operating a portable construction heater is minimal. Safety – The flame-free design of our indirect construction heaters enhances the safety of the machine, particularly when combined with other built-in safety features such as the high temperature shutdown, the heater’s fluid containment design and the auto air shutoff valve. Not only do these inclusions keep the operator of the equipment safe, but they also help to extend the useful life of the heater by preserving the integrity of the machines mechanical and electrical components. The clean operation of our temporary construction heaters also provides emissions-free heat to enhance worker health and safety. There are many different ways construction crews can utilize the heaters manufactured by Precision Equipment to make working on each site a more efficient and productive experience. Keep Work Sites Dry and Warm - Harsh and cold weather can make working on a construction site a very uncomfortable experience. This is particularly true of most of the work needs to be performed in an outdoor setting. Construction site heaters eliminate this issue by providing comfortable and consistent heat levels for the duration of any project. Sites affected by heavy rain and excessive moisture can also benefit from using temporary construction heaters to evaporate excessive moisture and keep crews dry and comfortable. 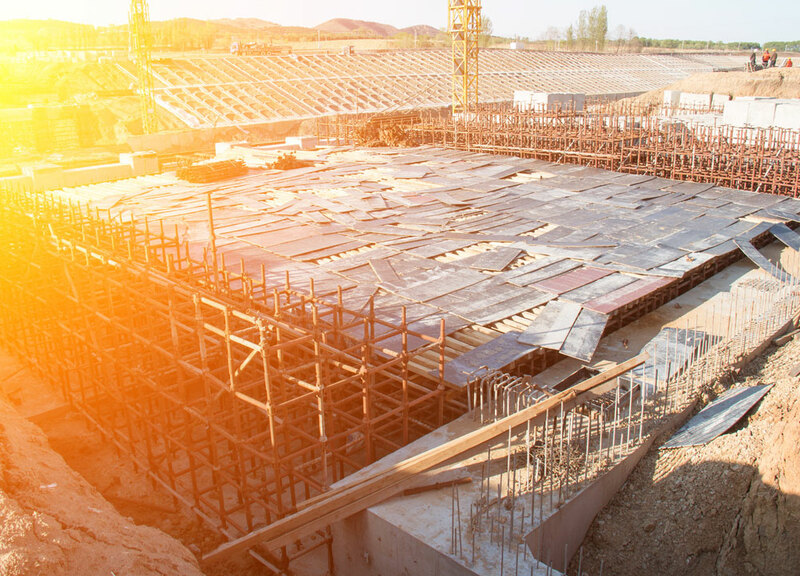 Ground Thawing – A common problem on construction sites during frigid winters is the ground becoming frozen solid, which makes it difficult to excavate to build foundations and do other construction activities. Our ground heaters remove this obstacle by quickly and easily allowing you to thaw up to four tons of ice each hour. Using a ground heater ensures that your projects never have to suffer delays due to cold weather that can disrupt an excavation schedule. The ground thawing equipment offered by Precision Equipment optionally comes with a powered/freewheel retractable hose reel to make thawing to depths of up to 12 inches a fast and simple process. Concrete Curing – Pouring concrete and having it set properly is extremely difficult in harsh winter weather. A Precision Equipment concrete curing heater with its revolutionary hydronic heating technology provides fast concrete curing while preventing damage to the poured concrete due to freezing. Our heater keep the concrete temperature steady, which prevents cracking during the curing process and ensures that the concrete develops an optimal level of strength once the curing is complete. With ranges that cover up to 7,000 square feet, our portable concrete curing heaters let you pour concrete confidently in cold weather conditions without having to build or heat an enclosure to do it efficiently. At Precision Equipment, we specialize in creating an indirect construction heater that provides operators and construction crews with easy to use heating systems. Our goal is to give you a “start it and forget it” experience that boosts work site efficiency and extends the useful life of your machine.